Washington Corrections Center is a mixed custody prison located in Shelton Washington. It opened in 1964 and houses a maximum of 1,268 male inmates of medium, maximum, and close custody levels. 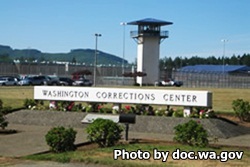 Washington Corrections Center has a unit specialized in housing inmates with moderate to severe mental disabilities called the Skill Building Unit. The Skill Building Unit is part of Cedar Hall and is designed to help inmates develop skills they need to function in prison. Skill building inmates are provided social skills and basic skills programming. Washington Corrections Center runs a sustainability project that consists of a composting program, a vegetable garden and recycling center. This facility has a vocational program that certifies offenders in Sanitation. Inmates can work in the Washington Correctional Industries program providing food services, laundry services, and warehouse distribution. Additional educational programs provide GED courses, adult basic education, and substance abuse treatment.